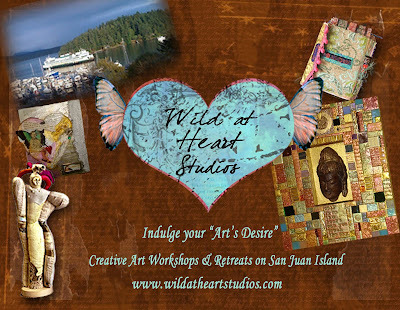 How would you like to learn all the newest mixed media art techniques...in a tropical paradise? A lot of your favorite workshop teachers think it's a pretty darned good idea: Dayle Doroshow, Jane LaFazio, Christi Friesen, and many others can be found lounging by the pool...I mean, teaching classes at Wild At Heart Studios. Indulge your art's desire! Get away to beautiful San Juan island for a one or two-day creative art workshop retreat! You will find a handy link to their gorgeous website (a link to future gorgeous good times?) in our sidebar. Pay Wild At Heart Studios a visit today and plan your next vacay for the colder months coming up. How wonderful! I'm (wishing I could be) there! !